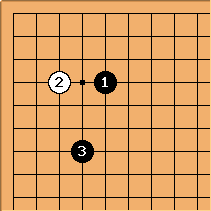 Given that tenuki is a break in alternating play in some local situation, and a joseki is a set pattern of play (approved by experts), this should mean such a set pattern that fails to go by alternation. See the tenuki joseki pages index for a list of such discussions. The index has been established with the following aspects in mind. 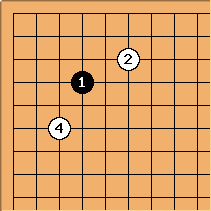 A sequence Black-Black in a corner is perhaps an enclosure, and that's not really meant by "tenuki joseki". 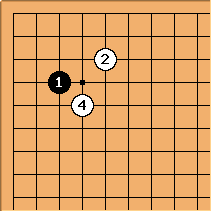 This here is more reasonably identified as the (ordinary) 5-3 press joseki rather than a 3-4 tenuki joseki. Therefore for the purposes of classification transpositions by tenuki between 3-4, 3-5, 3-3 and 4-5 joseki are probably better classified in their non-tenuki orders. It does however seem more natural to regard this double kakari joseki as being a 4-4 tenuki joseki, rather than a 6-3 joseki. 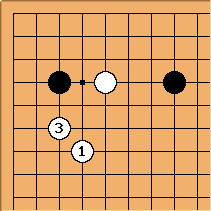 This is an example where tenuki next is actually recommended for White, as a way of showing that isn't severe. See 4-5 point 4-3 approach ogeima, tenuki for details. The possibility (always present - tenuki is always an option) of playing tenuki adds greatly to the scope of corner openings. For example Yu Ch'ang-hyeok has been playing tenuki as Black in this position in recent years: is one way for White next. See 3-4 point high approach two-space high pincer, ogeima, tenuki for more. The set of local groups is stable. Neither player has any urgent local move. All previous local investments have been fulfilled. The value for a subsequent local move has dropped significantly.